brand: Sony Pictures by Sony co.
Top thinkers join film / television stars — actors Will Smith + his son Jaden Smith — on air to talk about themes from their science fiction survival story After Earth. The film takes place on a post-apocalyptic Earth where nature and animals have taken over the planet. The Smiths engage innovators in a lively discussion about science, tech, and possible futures. bio: a Director of Engineering • Google co.
note: He’s leading thinker on tech progress. note: They’re the stars of the film After Earth. bio: founder • Space X co.
bio: co-founder • Tesla co.
bio: co-founder • PayPal co.
note: He’s an entrepreneur innovating space travel + electric cars. bio: Senior Advisor • Oceana org. note: She’s an environmental advocate, grand-daughter of ocean scientist Jacques-Yves Cousteau. note: She was a US Navy officer + held the record for longest space flight by a woman. 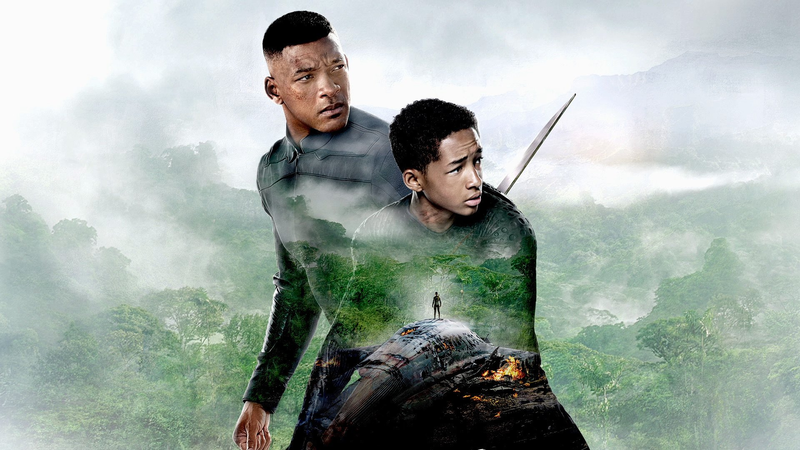 In the film After Earth a crash landing leaves teenager named Kitai Raige (played by actor Will Smith’s son Jaden Smith) and his legendary father named Cypher (played by actor Will Smith) stranded on Earth 1,000 years after cataclysmic events forced humanity’s escape. The story takes place in the 31st century: Earth has long been abandoned and humans have been in conflict with a mysterious alien race. It tells the story of a high-ranking general in the peacekeeping organization Ranger Corps and his son — who, after an incident during a spaceflight, find themselves fighting for survival on a hostile + unfamiliar Earth. With Cypher critically injured, Kitai must embark on a perilous journey to signal for help. He faces uncharted terrain, evolved animal species that now rule the planet, and dangerous alien creature that escaped during the crash. The father + son must learn to work together and trust each other — if they want any chance of going back home. The film’s production was directed by film-maker M. Night Shyamalan, from a screenplay crafted by Gary Whitta and M. Night Shyamalan — and a story written by Will Smith. Graphic poster for film After Earth: starring actor Will Smith + his son Jaden Smith. from: Sony Pictures by Sony co.
Go beyond the film After Earth with this unique, in-universe journey into the world of the United Ranger Corps. From the history of the United Rangers — to humanity’s exodus from Earth, and the on-going battle against the fearsome alien race called the skrel . The United Ranger Corps Survival Manual immerses you in the After Earth universe. Study the secrets of ghosting — the art of slaying the vicious ursa. Complete your mastery of the cutlass — a ranger’s greatest weapon. Discover what it takes to be one of Nova Prime’s elite. Filled with inter-active elements, including a schematic of the ranger base, a complete guide to the highly evolved animals of Earth. Plus a hand-written journal entry from character Cypher Raige. The United Ranger Corps Survival Manual is the essential companion to the film After Earth. label: The official pre-quel novel of the epic film After Earth. label: Includes bonus After Earth short stories. label: Based on the feature film. label: The official novel of the epic film After Earth. For the film After Earth IronHead Studio worked closely with costume designer Amy Westcott to create actor Jaden Smith’s costumes — that are called “life suits” in the film. * NASA = National Aeronautics + Space Admin. * Will Smith: is Willard Carroll Smith • Jr.